Istanbul is Turkey's most populous city as well as its cultural and financial center. This adventure is designed not only to guide you to the most photogenic locations carefully planned for the best light, but to aid you in mentally visualizing a scene before capturing the decisive moment. Our aim is to raise your awareness and spark your creativity so that you not only go home with images to be proud of, but use your newfound skills to improve and expand your photographic technique in general. Apart from the technical aspect of learning your camera settings and capabilities, you will learn how to turn an ordinary image into an extraordinary image by using your own creativity. In addition, you will become knowledgeable on how to survey the landscape, utilize and approach your environment, photograph people indigenous to the region and the cultural considerations and challenges of photographing in a foreign country. 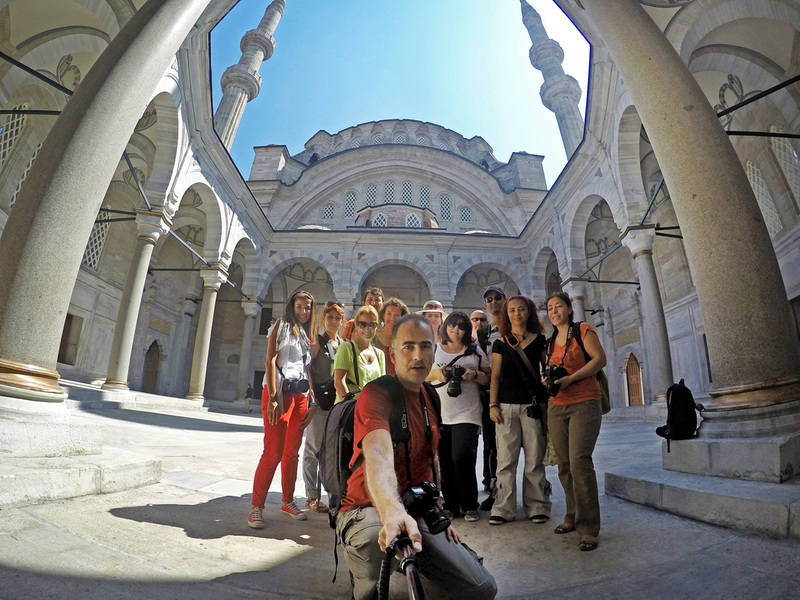 We cannot think of a better location to express your creativity than the amazing city of Istanbul! Itineraries are theme-centered and mainly take place in the broad area comprised within the old peninsula of Istanbul including Sultanahmet Square, the Hippodrome, Gülhane Park, Küçük Ayasofya, Kadırga, Ahırkapı, Cankurtaran, Beyazıt Square, Grand Bazaar (Kapalıçarşı) with its ancient inns, Zeyrek, Cibali, Golden Horn, Fener, Balat, Eyüp, Edirnekapı (Bird Market, Mihrimah Mosque, Chora Museum etc. ), Eminönü, Spice Bazaar, Karaköy, Galata, Beyoğlu, Çukurcuma, Cihangir, Üsküdar, Dolmabahçe, Ortaköy, Kuzguncuk districts and also the Prince Islands. In those destinations you can find the majority of primary landmarks, architectural beauties such as mosques, churches, statues, buildings and other artistic locations, most of which are lighted after sunset. My workshops/tours are built along themed itineraries and are available in morning, afternoon and night sessions. If you are interested in a customized tour, photographic themes can be agreed upon in advance, based on respective skill levels and interest. Register now or contact me for more information. The workshops/tours are limited to 8 - 10 participants and can also be organized on one-to-one basis and the program can be customized as per the participant’s wishes. Route - 1: Gülhane Park, Soğukçeşme Street, Hagia Sophia Square, Blue Mosque, Hippodrome, Sokullu Mehmet Paşa Mosque, Kadırga Street, Little Hagia Sophia Mosque, Akbıyık district, Cankurtaran district. Route - 2: Unkapanı Valens Aqueduct, Kadınlar Pazarı (Women’s Market), Zeyrek district, Molla Zeyrek Mosque, Cibali Street, Church of Saint George, Fener Greek Orthodox College, Bulgarian Saint Stephen Church, social life and ancient buildings of Fener and Balat districts. Route - 3: Church of Saint George, Fener Greek Orthodox College, Bulgarian Saint Stephen Church, social life and ancient buildings of Fener and Balat districts, Eyüp Mosque, Pierre Loti Hill. Route - 4: Unkapanı Valens Aqueduct, Kadınlar Pazarı (Women’s Market), Vefa district, Süleymaniye Mosque, the most ancient streets of Istanbul. Route - 5: Fethi Paşa Grove, Üsküdar Mihrimah Sultan Mosque, Bülbülderesi Semetary, Sultan Ahmet 3rd Fountain, Gülnuş Emetullah Valide Sultan Mosque, Şemsi Paşa Mosque, Rumi Mehmet Paşa Mosque, Aziz Mahmud Hüdai Hz. Tomb, Ayazma Mosque, Salacak coast and the Maiden’s Tower. Route - 6: Taksim Square, İstiklal Street, Cihangir, Çukurcuma, ancient Beyoğlu inns and important buildings (Doğan apartment, Mısır apartment, Narmanlı Han etc. ), Asmalı Mescit, Galata Tower, Karaköy, Galata Bridge. Route - 7: Beyazıt Square, Sahaflar Bazaar, Grand Bazaar with important inns (Yolgeçen, Cebeci, Zincirli etc.) and bedestans (Cevahir, Sandal), Nuruosmaniye Mosque, Çorlulu Ali Paşa Madrasah (hookah coffee), Abud Efendi Han, Büyük Yeni Han, Büyük Valide Han, Mahmutpaşa market, Rüstem Paşa Mosque, Galata Bridge. Route - 9: Mihrimah Mosque, Chora Church, Edirnekapı Bird Market, Edirnekapı streets, Balat, Fener streets, mosques, churches. Custom: With this tour, you can create your owned customized itinerary that meets your personal interests. You will have the opportunity to select places you wish to see at specific times of day, or research locations you have never seen before. Given their acquired familiarity with the city, our guides will work with you and offer suggestions geared most suitable to your curiosities and enjoyment. Explore the endless history this city has to offer with trips to equally stunning areas not often found on postcards. Experience rich Turkish culture as you’re guided through humble towns filled with family-owned shops, Turkish food and service providers, markets, streets, parks and districts. What to bring: You will bring the camera(s) you usually use and their lenses. We will select a minimum of equipment and wear comfortable walking shoes during our tours. 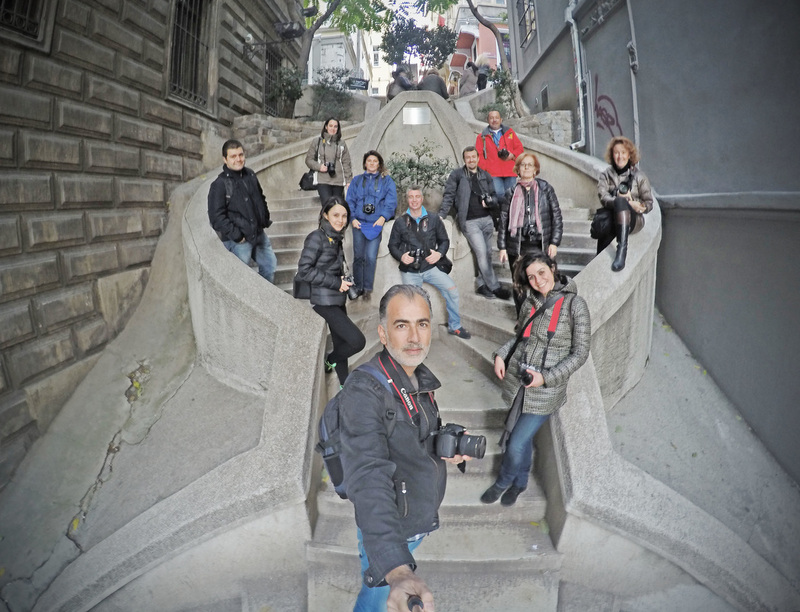 What to expect: You will meet like-minded people who want to improve their photography or enjoy their photography skills in a very photogenic city, accessing to the least known points of Istanbul by the guidance of an experienced photographer. You will walk a lot, be in the center of the local life in Istanbul, use the public transportation if needed, have lunch, tea or coffee breaks in the very interesting local places. And most importantly, you will be guided to beautiful parts of Istanbul on the right time for the right light to take pictures. What we will deal with: People, cityscapes, street photography, portraits, how to handle people, timing, composition, your goal as a photographer, messages in photographs, your unique talents and skills, how to set up a workflow, what to look for when editing, color management, speed of work, white balance, exposure, reflectors, quality light, finding locations, how to present your photographs. End result: You can expect to get a relaxed and simplified view on photography and realize that this is something you can perform well in, enjoy and produce much more than you used to.